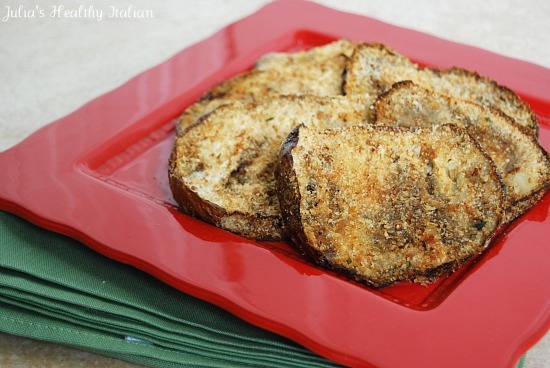 Super tasty, light and crispy these baked eggplant cutlets are a staple in my home. Its a quick easy meal that goes great with a salad... well, lots of sides. Eaten as is, or with crunchy bread drizzled with olive oil, these are real crowd pleasers. They store great in the fridge and you can even freeze them for later use for a delicous cheesy gooey casserole of Eggplant Rollatini. Its a great time to buy eggplant in its abundance and not to mention great price and make these to freeze later down the road. They will stay well in the freezer for up to 2 months. In a shallow dish (like a dinner plate) pour oil, in a second shallow dish pour breadcrumbs. Dredge eggplant through oil on each side lightly then bread with crumbs lightly. Arrange in a single layer on a baking sheet. 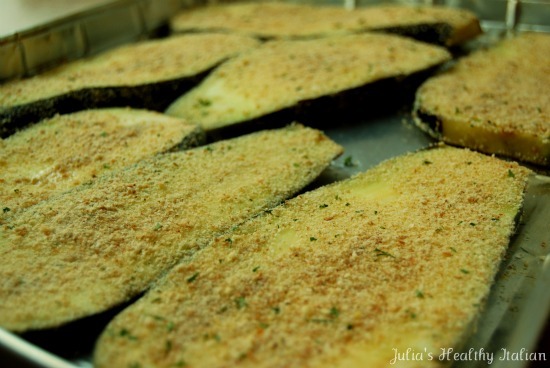 In a 400 degree oven, bake the eggplant on a lightly oiled sheet for 30 minutes. Thats it!! I made these tonight along with your Perfect Every Time Tomato Sauce and rigatoni. It was all wonderful. I love how easy it is to make the eggplant in the oven and it tastes as good as fried.I doubled the sauce so I would have some to freeze! Thank you for sharing these recipes! I love your blog.